There is an old story I heard about sea glass, but no one else seems to remember it. Perhaps it was told to me by the mermaids themselves as I walked the shore anticipating a glimpse of aqua or pink glistening in the sand. Its goes like this. 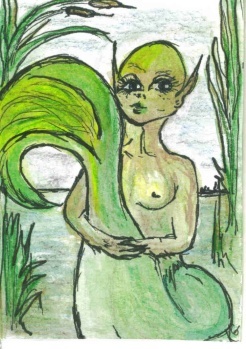 For hundreds of years, the mermaids, mermen and merchildren would look forward to the human children visiting the Chesapeake Bay shores after their chores to frolic in the waves, escaping the summer heat. The children could easily see the merfolk, and delighted in games and contests with them for hours on end. The sand was soft and clean, and the mermaids would keep small patches of beach as clear as they could for the kids. This was no easy feat, as the merfolk have bodies that are only half solid, not dense and strong like the humans. This is the way it was year after year, until the adult humans thought it would be a good idea to save land space by dumping glass bottles into the bay. The adult humans were very pleased with themselves, since they no longer had to dig deep holes to make a family "bottle dump". Well, once the tides started throwing the bottles around, any that weren't already broken shattered, and sharp shards of glass littered the beaches. The mermaids tried so hard to move all of it, but the glass was much heavier than lightweight branches and soft driftwood. Child after child began having injuries from the glass, and the merpeople helplessly watched their pleasant young friends disappear as parents forbid them to play on the dangerous shores. The mermaids and their children missed the little humans, and though very sad, they busied themselves in their spare time both day and night, carefully rolling the sharp glass in the sand and on the rocks, making it smooth, with the hopes that someone would realize the beaches were getting safer. But the sharp glass kept coming. This may be the origin of the term "mermaids' tears" for sea glass. Occasionally, a few groups of children, mostly rebellious boys, would visit the beaches. They would enjoy the water until they too, would get injured by the glass. But the mermaids didn't give up. Every time a small band of kids would visit a beach, word would spread among all the merfolk along the bay, and they'd work even harder. They became very creative with the glass shards and would often fashion them into perfect triangles, an ancient symbol for water. This went on year after year. It is important to point out that merpeople age much slower than humans and can live hundreds if not a thousand years. The mermaids continued to work with the glass, and they noticed that the adult humans were dumping less and less. There was, however, a strange new bottle that would float up every so often. It was lightweight, so the mermaids could corral the "floating bottles" into piles along the beach. They were not so sure what to do with it. One day, a mermaid mother was watching her babies play when she saw the strangest sight. It was an adult human, and he was meandering along the beach with a walking stick as if this was a fun thing to do. For years the mermaids watched most of the adult humans busy about with hard work, enjoying the water only with fast, loud boats and fishing nets. But this was so different, this man seemed to be so peaceful. 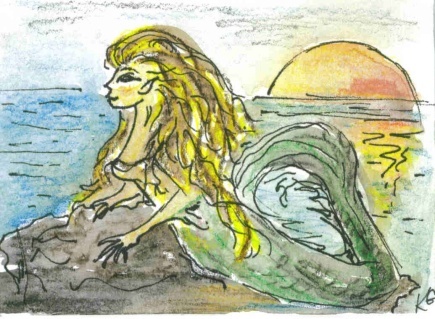 The mermaid called to some of her friends and they swam toward the shore, closer and closer to the man, who was now stooping at the water's edge, looking out at the water wistfully. 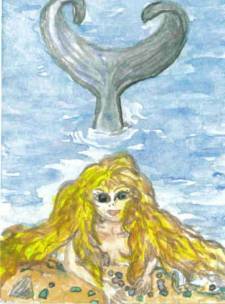 Mermaids rarely get close to adult humans, as these are one of the most changeable and unreadable of all God's creatures. But the bay ladies kept moving, until they were right under the man's nose so to speak. Though this man was in his sixties, the mermaids agreed his eyes looked so much like Richard, one of the rebellious boys that would frequent the beach, skipping glass shards across the water. The mermaids tried to get his attention, waving and throwing their arms in the air, but Richard couldn't see or hear them. He had lost his sight to the invisible realms as he grew older. The mermaids didn't give up, and they decided to try something else. They combined their strength to toss a perfect blue glass toward Richard. The resulting wave soaked his shoes, but the pretty blue object caught his eye. He picked it up, examining the smooth sides, trying to figure out what it was. After a few seconds he smiled broadly, remembering his childhood on this beach, and his glass tossing contests with the young merfolk. Perhaps it wasn't childhood pretending. He began to skip the piece. But it was so pretty, he put it in his pocket instead. Then another shiny object tumbled up, and another. Pretty soon Richard was scrambling about, collecting the old dangerous glass that had transformed into beautiful gems. The merpeople were ecstatic, and soon a large group of mermaids, mermen, and merchildren were hastily working to toss the "safe" pieces of glass further up to the shore. Richard couldn't hear their cheers as he picked each beautiful piece up and held it to the summer sun, but the merfolk were nonetheless happy again. This was a wonderful game, and it turned an adult human into an excited kid again. Well, word spread of Richard's activities, and soon humans of all ages were combing the Chesapeake beaches, much to the delight of the merfolk. All this energy of fun and enthusiasm is very healing to the waters. The mermaids would sing lovely tunes and watch as the human adults attempted to decipher the songs only the children could hear. Some of the adults, with much concentration, were able to hear the beautiful singing, and would even get a glimpse of a mermaid tail as they reached down for another piece of sea glass. So now, many years later, the waters are ever so slowly getting happier and healthier. The merpeople are hoping the people who love the Chesapeake will tell others how wonderful it is so it can stay happy and protected. So with the widespread use of plastic, will we run out of sea glass? The mermaids smile and say they have it buried layer upon layer in the sand...it will be around for awhile. Having a tough time finding it? Simply make your request to the merfolk the next time you're at the shore, and they'll help point it out to you. Try it. If its a glass free area, they will certainly toss up a nice shell, cool rock, or perhaps even an arrowhead as a substitution! As we speak, the merpeople are still trying make all that plastic as pretty as the sea glass. What a chore that is. And they're working really hard to keep the pollution down too. But they need our help. Please tell everyone you know to stop littering. So much of that trash ends up in the bay. Make it a point today do whatever you can, no matter how small a task or donation, to preserve our beloved Chesapeake today. The merfolk thank you!